I love Christmas music. I love the melodies. I love the memories so many of the songs bring to mind. I can listen to Christmas music year-round. 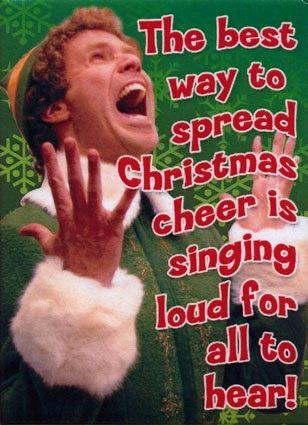 I sing Christmas carols around the house...in July. Just ask my wife, who graciously puts up with it. But it is now December, just eight days before Christmas, when my love of Christmas carols fits right in with the season. Unfortunately, though you can hear Christmas music in department stores and TV ads, it is increasingly rare that you will actually run into carolers. Indeed, caroling seems archaic. It is in response to this sorry state of affairs that I am issuing a challenge to my fellow bloggers, friends on social media, and really anyone. Let's take caroling to the 21st century. I will share your videos on this blog. If no one joins in on the fun, I guess I can just post Pentatonix Christmas videos instead (man, they are good). Of course, I can't issue a challenge without first meeting it myself. So here is "Have Yourself a Merry Little Christmas." I hope you'll join me in taking caroling to the 21st century!